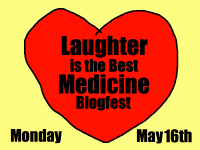 "Laughter is the Best Medicine" blogfest is courtesy of Leigh at That's Write! Here's how it works. On May 16, do the following: Post your favorite writer joke. If you don't have a writer joke (are there any? ), post your favorite job-related joke. And if you don't have one of those (either writer- or work-related joke), post your favorite joke (or funny story).